This month’s Writer’s Forum magazine suggests taking a step back from your writing and having an “ideas week” as an antidote to burnout. Well, I think I agree with their approach! Just back from a week in a holiday cottage in Wales – sleeping, eating, walking, site-seeing – all very conducive to battery-recharging. Have managed to return with at least one almost fully formed idea for a long story (possibly even enough for it to be the basis of this year’s NANO attempt), and another scribbled beginning. Last night in that dozing moment before properly going off to sleep, I even had an idea for a potential amendment to a previously rejected story, so might have a crack at that today. I deliberately didn’t take my laptop on holiday – partly, it has to be said, because the thing is on its last legs and tends to do rage-inducing things like randomly switch itself off whilst I’m in the middle of typing (and that sort of thing always seems to happen when you think you’ve written something spectacular, and the re-write never quite measures up). But partly it was just to have a change of pace. I took a notepad and pen instead. And I scribbled. It was fun. Mid-week, issue No 78 of The People’s Friend Special was out, and it was an extra special joy to pop along to the newsagents in tourist-mode and be able to pick up a copy – which includes my story ‘Going Solo’ (with an excellent illustration by Jim Dewar – Judy is exactly as I pictured her!). ‘Going Solo’ was a story originally written for my local writers’ group – yet another reason I have to be grateful for the group’s support, encouragement and deadline-provision! The publication of this story though has given me a bit of a slap as it’s the last thing that was “out there”. I now have no other stories so much as submitted, let alone awaiting publication. So it’s official: the holidays are over – time now to get back to work! Of course, it’s a very rough and ready first draft, and there are many holes and problems still to sort out. But at least it’s a place to start from – so much less intimidating than a blank screen. After a few days of slipping back to only just keeping pace with the word count, have had another productive day today with 2,400 words done. No, it doesn’t have the same sparkle as it did on those first two days (though I’m not allowing myself to read back over it), but it’s building, and some of the things which started out as quite insubstantial now seem to be firming up in my mind. Hopefully I can crack on tomorrow with another decent day. Day 3 – and the pace is slowing! Well, I wasn’t going to keep it up, was I? 3,000 words a day? Come on! But I’ve still done just short of 2,000 words today. It’s not quite as sparkling as the first two days’ output, but I’m still well ahead of the target word count, so I’ve got plenty in hand for next few days when I fear no progress will be made at all! Also, was slightly distracted today by the Ether Books people getting in touch and me then having to upload Out of Her Misery onto their site. Hope I’ve done it right. Had a moment’s panic over the requirement to provide a photograph – there’s something I’d not considered the need for! Just had an email from the good people at Circalit telling me the judges have selected my short story as the winner in their CircaChallenge competition. Absolutely delighted! Never expected, when I first saw the competition and decided to enter, that I would win – just thought it would be an interesting exercise, and liked the scenario which formed the basis of competition. So there you go – it’s always worth entering. 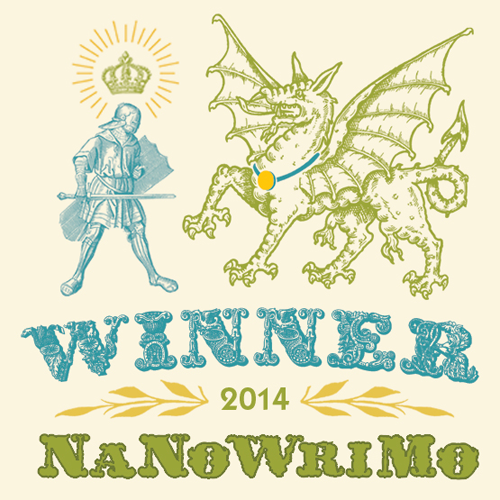 Day 2 of NaNo – am over the 6,000 word mark. Really wanted to press on during these two days, so am exactly where I hoped to be. And while I’ve so far resisted the temptation to read back over what I’ve done, I’m really pleased with the way the characters feel and are turning out on the page. Sometimes in my stories they start off a little shadowy and take a while to develop but these guys are really shaping up already – let’s hope they work as well for the reader. NaNo day 1 – and what a successful day’s work. Well, morning’s work. Sat down a little after 7am and by lunch time, I’d done 3,104 words – that’s the whole of Chapter One drafted out. Brilliant prose, it may not be, but it’s definitely a good start. I need to clock up a decent word count over the first few days to give me some slack on the days I have other commitments and know I won’t get much done. And if I can keep up the current level of output just for even a short while, I’ll be pleased. Right, bed now – need to rest before day two!